Welcome to the homepage of Islington NASUWT. For the time being it will be used to share some information with members as well as linking to other members services. Islington NASUWT members are welcome to join an e-mail group to receive notices of meetings, minutes and newsletters. To view the local newsletters, policies and notices click here. Please take the time to fill in a workload questionnaire. If you are from outside Islington, please say this on the form. Send it in the post or by fax to the address at the bottom. This year is the one hundredth anniversary of the 1906 Trade Union Act. While the rights gained in this historic act were extended with time (and struggle) across Europe, almost uniquely in the UK we have actually lost some of those rights. The culprit was, of course, the Thatcher Tory Government. This year, however, there is considerable support for an early day motion in Parliament for a Trade Union Freedom Bill drafted by John Hendy QC. A May Day March has been organised by the TUC unions beginning in Clerkenwell Green, so it's very local and weather on May Day is always guaranteed. Download a flyer.. There will be a meeting on Thursday 11th May promoting the book "Tell it Like it Is" from 6pm at Islington Town Hall. It highlights the extent to which Black Students underperform is British schools and investigates why. Speakers include Jeremy Corbyn MP and Lethal Bizzle (musician). Free entry, download a flyer. The next meeting if Islington Campaign Against Academies will be Weds 10th May at the Town Hall. The march was a success with several thousand trade unionists marching to Trafalgar Square. It achieved modest press coverage, but was enough to show support for the early day motion in Parliament. We will keep you updated on its progress. Back to Birmingham. There are three groups of rules proposed to be changed. The first relates to when a member ceases to be eligible for full membership when they retire. The second is about members being officers in more than one union. The third is about detailed changes to how complaints against members are dealt with. We currently anticipate opposing the changes. 12-15th April 2006 Conference in Birmingham. See the newsletter for information. UNISON and GMB members have voted for a day of strike action on Tuesday 28/3/06. It is likely that the majority of schools in Islington (and elsewhere) will be closed for the day. Unlike teachers' pensions, for which we will retain the benefits which existed when we JOINED the scheme, the government would like to change the pensions of other public sector staff, even though those staff have been contributing for years. Members will receive advice NOT to undertake ANY work which normally be done by UNISON or GMB staff. In all likelihood this will affect not only schools, but all public sector offices. Islington Campaign Against Academies has a stall at a conference at the Institute of Education on 25/3/06. The event will discuss whether the Education Bill will meet the needs of students. It is not an NASUWT conference, but as we are involved in the campaign against academies we will be supporting ICAA on its stall. To download a flyer. Compass, a left wing research organisation have produced some interesting figures on the level of support amongst Labour Party members. Schools which have not yet begun the consultation for the staffing reviews are now likely to be in difficulty. There must be a minimum four week consultation, but there must be scope for further consultation if there are significant revisions to be made. A school which does not allow time to consider comments and adopt amendments cannot be considered to have consulted. That having been said, the majority of consultation documents being issued now have job descriptions (not always complete, but sufficient), structures showing all staff and costings. The planning committee decided to approve the application to close St Mary Magdalene Primary School, which opens the way for the establishment of a 1600 pupil City Academy on the enlarged site. This was despite a considerable local opposition including teaching unions and parents. 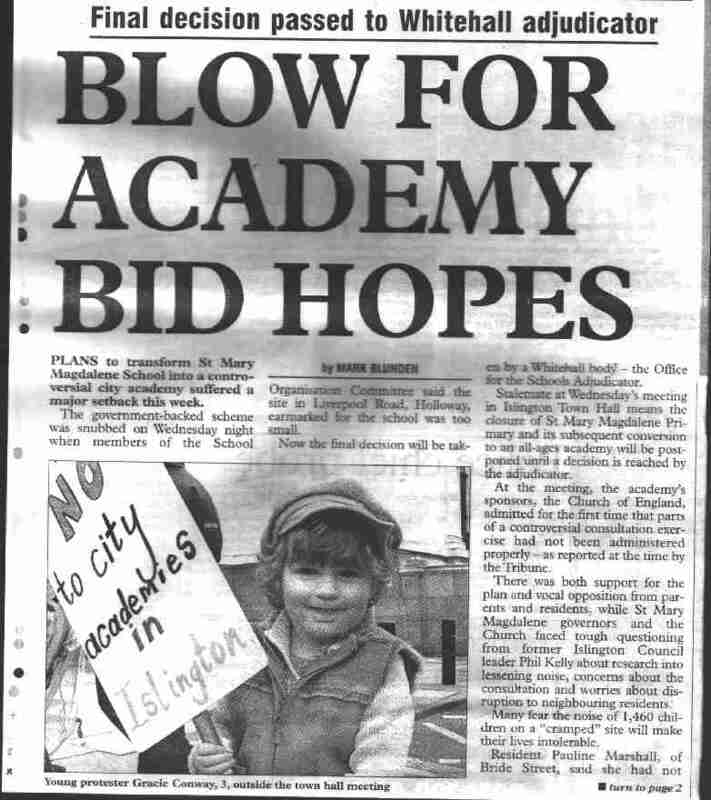 More information on the Islington Campaign Against Academies. It has been confirmed that no disciplinary action will be taken against staff "caught on camera" at Highbury Grove School. The Corporation of London formally confirmed today that it is negotiations to be a sponsor of an Academy in Islington. There are concerns that Bill Clark, Director of Education, has written to headteachers, insisting that they consider disiplinary action against those filmed in the programme. NASUWT will not tolerate suggestions that its members can be disciplined for comments made in private. After the atrocity of the bombing of London tubes and buses today. Two Islington Schools have been featured on a Channel Four TV programme "Despatches". NASUWT does not condone the use of such undercover techniques to expose what teachers say within the staff room. We are also concerned that a TV programme should risk identifying children at risk in such a way. ARK have withdrawn from the Islingtoon Green/Morelands Academy project. The headteacher of Islington Green School would like to continue the project as an 11-18 academy on its own site, possibly still shared with Richard Cloudesley Special School. To see the CEA press release.. The second anti-academy meeting will be held at 7pm. Contact me for details. Apologies for the lack of e-mail newsletters etc and for those who have not received nomination papers in their inboxes yet. This is due to teething problems with the union's changeover from poptel to claranet. Hopefully it will resolve itself soon. For one of the final visits of her Presidential year, Pat Lerew will be meeting members at Highbury Grove School as part of a visit to London. She will be particularly interested in the progress of the "Health and Wellbeing" Project. Kathy Duggan (Lewisham) and Anne-Marie Flavin-Lees have been elected as national Executive members for Inner London (District 23). Congrats and all that. 9TH FEBRUARY 2005 ISLINGTON GM This will begin at 4:30pm at the NEW London Regional Centre. It has been revealed that the OFSTED team who decided Islington Green School was failing in 1997 and helped push the LEA into privatisation may have working to an agenda that has little to do with education. Full story in both todays Guardian and TES. A misleading circular has been sent to headteachers suggesting that there should b extra hurdles and an application to progress up the upper pay spine (UPS). This is based on a (complete) misunderstanding and has been addressed. We are, however, discussing ways of ensuring that there is some standardisation across the LEA so one school does not ask for PhD's when others are satisfied with INSET. HAPPY NEW YEAR to teachers everywhere. Apologies for a break in service due to server problems with the ISP. We have now moved and normal service has hopefully resumed. 12TH OCTOBER 2004 We will hold a public meeting at Islington Central Library in Fieldway Crescent to oppose the two City Academies proposed for Islington. This is being organised jointly with GMB NUT and UNISON. Our opposition is because of the threat to our pay and conditions as well as objecting to the effects of encroaching privatisation on education. A public debate is being planned for the new year. We will publish a list of speakers when it is confirmed. 30TH SEPTEMBER Asbestos training day - Barnsbury. 16TH SEPTEMBER 2004 Consultation has begun on several new personnel "policies" to run alongside existing procedures. These could only cause confusion, so we are stearing CEA towards a worthwhile revision of procedures. (Sept 04)We will shortly be publishing pictures from the march - -my apologies for the delay. The Newsletters of the Islington Association are now also available on-line or you may view previous years' "Update"s.
If you have had enough work here are some pictures to colour in. Alternatively we have a few games you might like to try. Link to NASUWT National website.